Aladdin Project’s Board of Directors held its first meeting in Paris on November 9, during which it approved a multi-faceted program that focuses on education, public information, network-building and the Internet to raise awareness of Holocaust history; to promote intercultural dialogue and understanding: and to combat all forms of racism, xenophobia and ant-Semitism. The Board is composed of prominent intellectuals from different faiths, cultures and countries. Initiatives adopted build on and enlarge the program launched at UNESCO in March. They include expansion of the Web site and translation of six new books to enlarge the existing collection of the online library. Two conferences and exhibitions will be organized in Egypt and Turkey in May and November respectively. Also in 2010, the Aladdin Project in partnership with a major British university will set up an online degree course on Jewish-Muslim relations available to students in Islamic countries, while preparations are being made for a summer school that will together students from around the Mediterranean for conflict prevention training as well as educational programs that enhance mutual knowledge. “When we launched the Aladdin Project, we said we were putting our faith in education, diffusion of information and the good will of men and women of conscience opposed to injustice and perversion of history. The fact that we are all working together and that hundreds of intellectuals and civil society actors, particularly from the Muslim world, have welcomed our initiative shows we were right,” she said. David de Rothschild, president of the Aladdin Project’s endowment fund, told Board members that the impressive array of talents and competence in different fields that they brought to the table reassured him of the success of the project. He recalled that funding for the project’s initial stages came almost entirely from the Foundation for the Memory of the Shoah, but with the new independent bodies that have been created - a non-profit organization and an endowment fund - private and corporate donors, institutions, international organizations and governments would provide the necessary funds. The members of the board discussed different approaches and strategies to achieve the goals of the Aladdin Project. André Azoulay, advisor to the King of Morocco and president of the Anna Lindh Foundation, said the impressive success of the Aladdin Projwect up to this stage showed that we must continue along the same course and fight Holocaust denial while not forgetting that at the same time that the Holocaust was taking place in Europe, Jews found refuge in certain parts of the world, including Morocco. 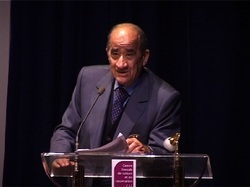 Prominent Moroccan philosopher Professor Abdou Filali-Ansary laid particular emphasis on the necessity to teach the history of Jewish-Muslim relations particularly to younger generations in countries such as Morocco and Tunisia, where they are largely unaware of this long history, with all its ups and downs. Egypt’s Dr. Aly Elsamman, an advisor to the late President Anwar Sadat and a veteran campaigner for improved Jewish-Muslim relations, underlined the importance of educating people on both sides of the cultural divide about the other’s history and culture to achieve better understanding and mutual respect. Turkish anthropologist and world authority on Muslim women’s movements Dr. Nilüfer Göle proposed the creation of a working group to study different approaches to memories, histories and narratives, particularly with regard to genocides. Iranian sociologist Chahla Chafiq said projects should also focus on the role of women in different societies as key agents of change on the road to intercultural understanding. The Board also discussed the composition and activities of the different committees, including the Committee on Conscience, the Aladdin Project’s international advisory board chaired by Ambassador Jacques Andréani, the Book Committee chaired by Jean Mouttapa, the Interreligious Engagement Committee chaired by Chief Rabbi René Samuel Sirat, and the Committee on Universities chaired by Jean-Claude Lescure. The Board noted with satisfaction that UNESCO’s General Conference has recently adopted a new resolution expanding the organization’s role in Holocaust education and remembrance in “all countries”.